Note: While the Daredevil movie is banned in Malaysia, it is not widely known that the film suffered cuts in Singapore. No details are given pertaining to scene/s or duration that was/were cut. The edited version of the film was given a PG rating and passed clean. He stands outside his brownstone in New York City. Facing an audience of hungry journalists. Bulbs flash, cameras whirr, questions are shouted. 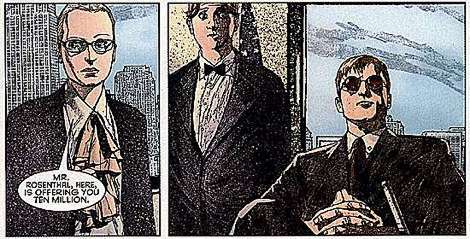 Matt Murdock is about to tell a lie. "This morning my law office has filed a US$400 million libel suit against Rosenthal Publications, the owners and publishers of the Daily Globe. "We have filed an invasion of privacy suit against the newspaper as well." 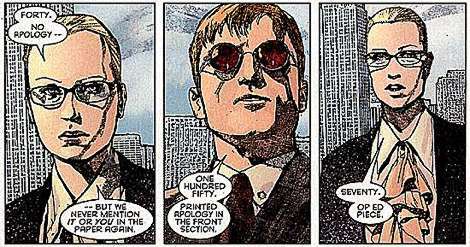 Matt Murdock had just denounced that he is Daredevil, the costumed crimefighter. "The [newspaper] headline stated that I was the masked vigilante known as Daredevil. That I was faking my handicap, that I was pretending to be blind as a cover for my secret costumed life as Daredevil. "This information is 100 % untrue." It is an intriguing twist to the secret identity conundrum that has plagued superhero writers since Superman put on a pair of spectacles. Why should heroes need to work above the law? Are they accountable to the public? The questions sound like those posed by publisher J Jonah Jameson in the Spider-Man title. In fact, writer J Michael Straczynski already explored the identity crisis not too many issues ago in Spider-Man [#36]. But so far, Marvel are proving to be quite agile in offering brand new perspectives on this age old quandry. 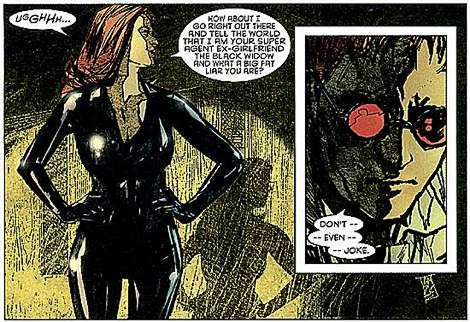 As it stands in this issue, Murdock refuses to be persuaded by his old flame, The Black Widow, to put on his costume. More trouble than its worth? Maleev still plays a distant second to Bendis sterling script. That said, Bendis is a difficult man to work with. Just look at this cover. DD sobbing at the feet of Elektra. Even as we read and re-read the comic, we couldnt come up with a better visual to illustrate the point of the comic. Because this month, and for that matter the past couple of issues, the plot is strong on issues and not "action". So whats an artist to do? How do you illustrate "truth" or the concept of "vigilante" action? The current story arc about the revelation of Daredevils secret identity in the press takes up the point of why superheroes need a secret identity that has been trashed out for decades in all those early Superman and Batman comics. They have to protect their loved ones, their private lives must remain private yadda, yadda, yadda. Bendis has come up with a new way of telling the same old story. 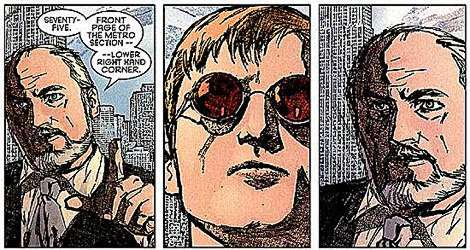 Matt Murdock knows he is Daredevil. The newspaper publisher knows he is Daredevil. But the publisher cannot push his case, as DD has harassed his source who now refuses to testify in court. So an out-of-court settlement is the "pragmatic" choice. But as much as the publisher wants to settle, Murdock wants his "pound of flesh". Remember, the original lawsuit Murdock threw at the publisher was for US$400 million. In the exchange between Murdock and the publisher, Murdock takes on an unfamiliar role as the hard man. He is the liar because he is Daredevil. By the time they agree at US$75 million as the price the publisher must pay for calling Murdock, Daredevil, the publisher reneges on the deal. "You annoy me, Murdock. You just annoy me. (mutters) Laugh in my face. You settled for the exact amount I was ready to give you  the exact amount. Youre conning me. I wont be conned. "The hell if Im going to pay money out of my pocket for reporting what I know is the truth. Forget the lawyers! Lets go the distance."